*Click here to see a slideshow of remarkable women throughout history featuring music by the 12th century female composer Hildegard von Bingen. 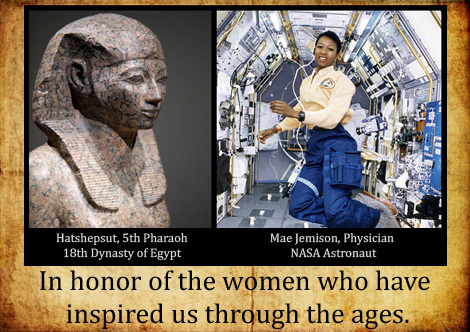 This entry was posted in Blog, Culture, Holidays, Public Life and tagged ancient history, ancient women, AntiquityNOW, Hatshepsut, International Women's Day, Mae Jemison. Bookmark the permalink.